I buy teeny, tiny “ice fish” — no longer than a nickel and pale white — at the Japanese market, coat them in a light tempura batter and make fish fries. I buy smelt or other little fish, and recreate the fritto misto that traumatized me as a child in Italy. I purchase silvery sardines to pickle or throw on the grill. I can’t remember when it all changed, perhaps it was the climbing-a-mountain/crossing-a-new-frontier aspect it. But whenever and however, I became a devotee of diminutive dabs. I have memories from even earlier in my childhood of grunion runs — more the mythology of the event than the actual activity. (I think I may have gone once, although I likely wouldn’t have made it to the beach and stayed behind in the car sleeping instead.) On certain nights, our local beaches were flooded with spawning grunion — millions of them. You would chase them down, grab the slippery little suckers, and if you could, toss them in a bucket. “What would you do with them then?” the childhood me asked with apprehension. “Eat them!” would be the reply. And in my mind, I gagged as I imagined a small live fish wriggling in my mouth. Besides the smallest fish that fry up so exquisitely are the slightly larger fish, such as one of my favorites — the sardine. Among one of the world’s most sustainable of seafood, you can feel guilt-free joy as you shove dozens of the little guys down your gullet. Sardines have long gotten a bad rap in the U.S., the result of so many forgettable encounters with morbid little cans of long-dead silvery fish still sporting their guts and bones. But anyone who has eaten them in a café on the Italian Riviera or in a taverna on a Greek isle will tell you they are one of the best fish. In addition to one of my most beloved preparations, the Roman pickled dish, pesciolini in scapece, I like them simply cooked on a hot grill, then drizzled with olive oil and lemon juice. Or, jazz them up with an Italian salsa of orange and fennel and serve with proseco on a warm night to those new friends you’ve been wanting to impress. If you like your little fried fish with heads, leave them on. If not, twist off, pulling the intestines out with the head. Make a slit where the stomach is. Rinse to remove any remaining innards, and continue until you’ve cleaned all the fish. In a wok or shallow saucepan, heat your oil over medium high heat until a drop of the batter mixture sizzles and floats. A few at a time, dredge the smelt in the flour on the plate, then dip into the batter mixture and drop immediately into the oil. Use tongs to move the fish so they don’t stick together. Cook for 1-2 minutes, or until crisp and golden. Remove to a plate lined with paper towels, and place in an oven preheated to 180 degrees. Continue this way until all the little fish are cooked. Serve on a large plate, squeezed with lemon juice and sprinkled with salt. Place cleaned sardines on a plate to drain. Meanwhile, place shaved fennel in a bowl of water to remove any sand or grit. Drain thoroughly, turning in a salad spinner or shaking inside a few paper towels. In a medium bowl, whisk together olive oil, orange juice and vinegar to create an emulsion. 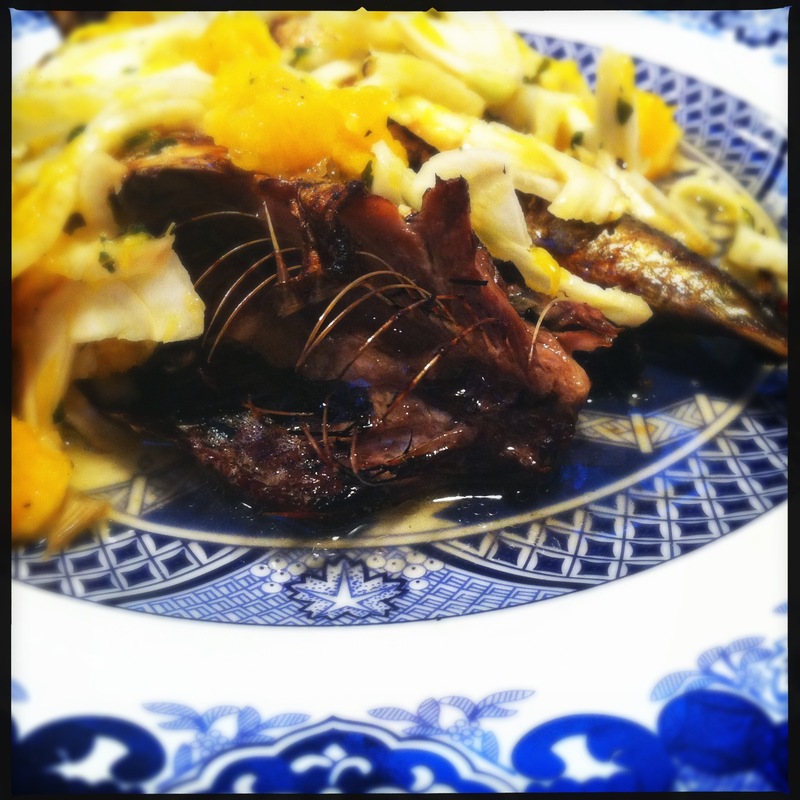 Toss in fennel and orange segments, and set aside to let flavors meld. Spoon the fennel orange salsa over the fish, drizzling with any remaining sauce. Sprinkle flaky sea salt and freshly ground pepper over the top. Serve with thick grilled slices of ciabatta drizzled with olive oil and sprinkled with flaky sea salt. Thanks for reminding me why I generally leave the fish to the restaurants. Or to the dining room of some brave person like yourself. I know they must be good, though! 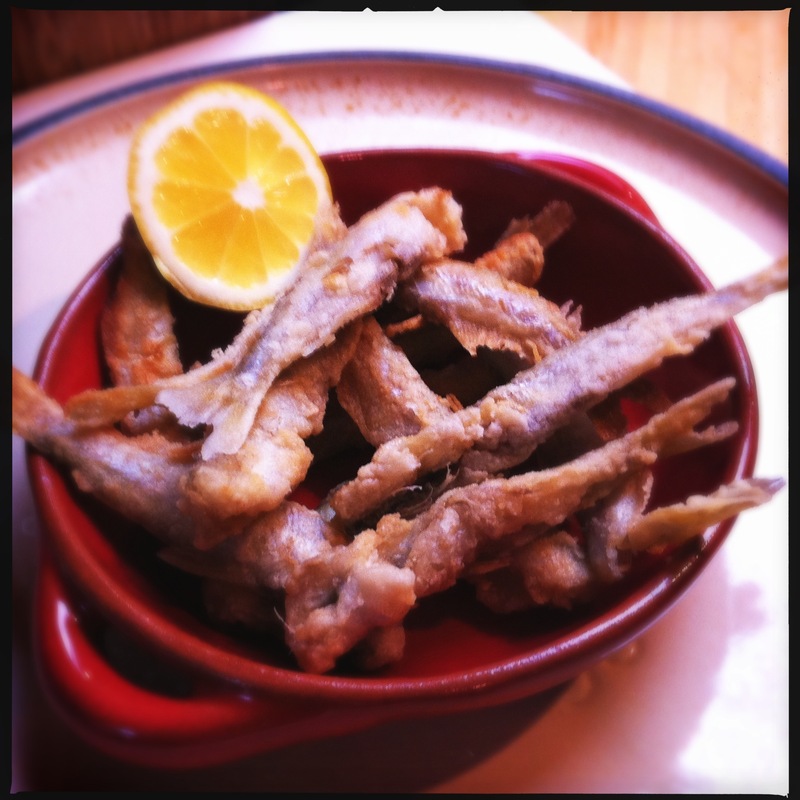 We recently had the little fried fishes at Taverna Tony’s in Malibu – they looked just like your top photo. I haven’t had canned sardines in ages, but I remember eating them on saltine crackers with my dad, usually on Sundays. I’m looking forward to eating little fishes in Venice. Any opportunity to remind me about your upcoming Venice trip, right??? Oh, don’t forget to borrow the beautiful Venice cookbook I got at the Jewish Women’s thrift store to browse through before you go! Don’t do heads…never have…Mom never did heads…. Oh man, there’s a bar that I go to (http://rootstockbar.com/) where I eat the smelt like french fries. Better yet, my wife doesn’t steal them! I’m a fan of Things the Wife Does Not Steal. (In fact, do I see a blog post in that title??) I’ll often order something for that reason alone. I know I’ll be able to enjoy an order of sea urchin at the sushi bar or octopus at the Greek joint all to myself. My wife will not share foie gras, roasted bone marrow, very runny cheeses, little fish, cheesecake, and maki make out of mackerel or salmon skin.